Gamblogger: Lincoln Casino Player has Memorial Day Winning Streak that Included $96,040 on 1 spin! Lincoln Casino Player has Memorial Day Winning Streak that Included $96,040 on 1 spin! A Lincoln Casino player had a terrific start to his Memorial Day weekend with an amazing winning streak including a $96,040 spin on WGS' Mile High slot. On Friday, as the Memorial Day weekend began, Darren G. started by winning his bank roll up to $11K playing Lucky 7s. After playing Lucky 7s for a while, he switched to Mile High where his winning streak really got going. "A lot of players had a really good weekend at the casino," observed casino manager Ryan Wilson. "Darren sure did a lot better than most though – this will definitely be a memorable Memorial Day for him!" 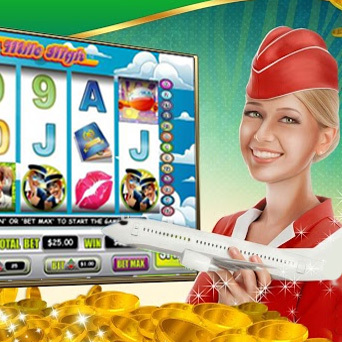 "Lucky Sevens is a highly volatile progressive jackpot slot game so I only really play it when I have a decent balance. I played for a couple of hours, just small bets, around $6.00 a spin. I was lucky to hit three purple 7s with two Wilds. That would have paid $240 but with the two Wilds I got a 49X multiplier, so that paid out $11,760. That gave me a nice cushion!" "I stuck with the Lucky Sevens for a while longer, but figured my time was up on that one so switched to a five-reel called Mile High. 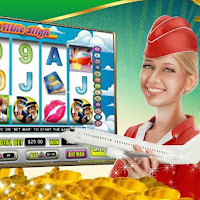 It's kind of a cheesy airplane-themed game, but it has some decent features -- a couple of bonus games and free spins with 16X multipliers that seem to pop up quite frequently." Darren played for a couple more hours, then switched to Roulette and then some video poker games. He was about to call it a day when he decided to give Mile High another shot. Forty-five minutes later, on a free spin with a $6.25 bet, he hit five of the cheeky Pilot symbols on three pay-lines with two Wild symbols on each line. At twenty-five cents a line that would normally pay-out $2000 per line. But the Wild symbols added a 16X multiplier, so Darren landed $32,000 on each of the three lines, plus some loose change on five others. All told, he won a whopping $96,040. Lincoln Casino has a huge selection of unique slots and casino games from WGS and has just launched the new Goblin's Gold. Until June 10th, you can get 50 free spins on the ghoulish new game – no deposit required (coupon: GOBLIN50LC). "Darren's been playing with us for about five years now and we couldn't be happier for him getting this huge win," said Wilson. "It's always great when these things happen. It ramps up what I call the 'could be me' factor, especially when you get such a massive payout from a pretty small bet!"